What exactly IS Mind Pump? Mind Pump is an online radio show/podcast that is dedicated to providing truthful fitness and health information. It is sometimes raw, sometimes shocking and is always entertaining and helpful. 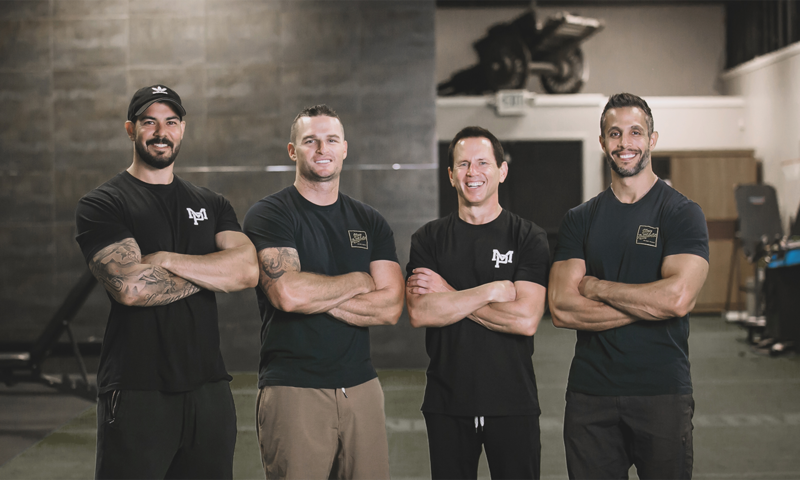 Your hosts, Sal Di Stefano, Adam Schafer and Justin Andrews have over 50 years of combined fitness experience as personal trainers, club managers, IFBB fitness competitors and fitness thought leaders. The fitness world is filled with charlatans and snake oil salesmen pushing the latest and greatest (and sometimes downright dangerous) workout programs, supplements and faux science on the unsuspecting masses. Sal, Adam, Justin and Doug got fed up with the industry marketing to an individual’s insecurities and profiting without any regard for results. They came together and created Mind Pump as a platform to shed the light of TRUTH on health, fitness and a host of other wellness topics. By listening to Mind Pump, you will quickly cut through the fitness world BS and start to understand the absolute fastest way to reach your health and fitness goals. Watch the video below to find out more about who we are and our core values. We have created programs for every type of person, designed with specific goals in mind. Building muscle is the natural result of an adaptive response that ONLY takes place when your body is being SIGNALED to adapt. Without the proper muscular adaptation signals, your body will actually AVOID building muscle and losing weight. Our online training programs are phased into mini-cycles to avoid hitting plateaus that lead to frustration and burnout. Our focus is helping people achieve a better quality of life. Started by a labor of love for health & fitness. Which MAPS program is best for me? This depends on your individual goals and your experience in weightlifting. Each program has a dedicated page that offers a detailed description. We suggest you look at each one to see which is a good fit for you. What is the difference between a bundle and a MAPS program? Bundles contain multiple MAPS programs combined in a synergistic fashion to be used either concurrently or in sequence. All bundles are offered at a discounted rate that will save you hundreds of dollars in the long run. Individual MAPS programs are just one program. How can I become a guest on your podcast? Please submit an inquiry on the contact page. We will reach out to determine whether or not you would be a good fit for the show. Are you accepting new affiliates? We are always interested in additional partnerships. Please contact us at info@mindpumpmedia.com and let us know what your brand is about and how you would like to work with Mind Pump. Do any of the founders offer personal training or coaching? No, not at this time. However, all MAPS programs were personally designed by Sal, Adam, & Justin. You don't need to take our word for it. Hear why so many people love our MAPS programs. ...For me personally, for the first time in my life, I'm comfortable with myself, happy with myself." ...I want to thank you guys for making my life better." "I want to talk about how effective I think you guys are for women. I appreciate that it is not all about how you look. I appreciate how you talk about all of the common pitfalls people fall into. Especially women trying to lose weight. ...MAPS has allowed me to feel like a strong, confident woman in my own skin." Everything you need to know to reach your health and fitness goals. Stay Up To Date With All Mind Pump News! Weekly videos on ALL THINGS health & fitness. We aim to provide you with all of the knowledge you need to lead a healthy & fulfilling life. Sign up to receive one email per day covering nutrition, resistance training, cardio, health and wellness. We don't shy away from giving our honest opinion on all of the hottest topics in the fitness industry.